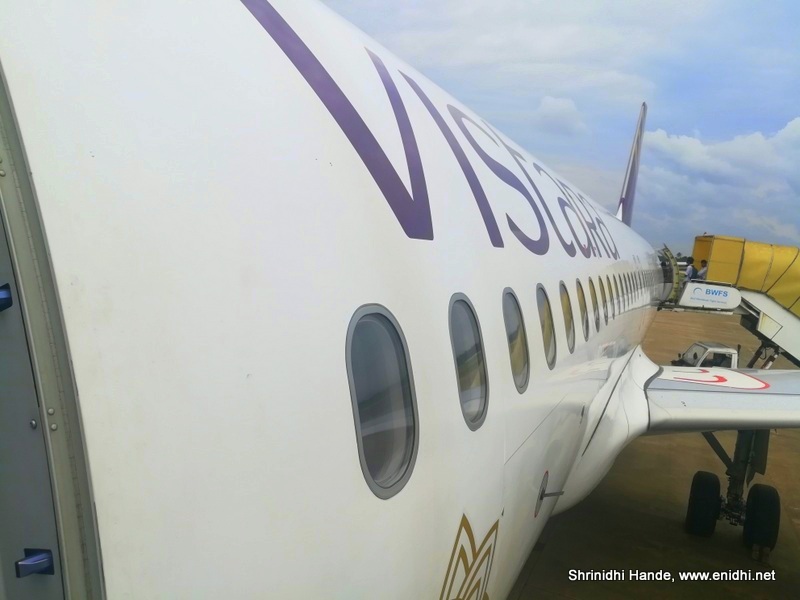 I had my first flight with Tata Singapore Airline group venture Air Vistara. Air Vistara is clearly the popular airline for many as of now, given the troubles with Jet Airways and Air India, other two prominent full service airlines. Vistara stated Chennai operations very recently (Feb 2018), so I could only experience their service now, several years after they began operations. In February this year I booked a cheap return ticket to Kochi from Chennai, for about Rs 2300 per person. The trip that happened a week ago was a result of this purchase. Created an account on Vistara website, but due to my error or system's only first few characters of my name were registered. The name is non editable in the profile, got it rectified by sending a mail to Club Vistara. Due to Kerala floods there were some concerns if our trip would happen. Thankfully flights to Kochi resumed from August 30. When I spoke to Vistara customer care I was told free cancellation/rescheduling is allowed only for those had travel date till 5th September. My travel date being 12th September, I stood to lose 100% if I don't fly. Other factors being favorable, I decided to proceed with the trip. For the onward journey my sequence number was 001- but I was assigned a seat in row 22. System would show all forward rows as unavailable, which wasn't true. For return journey row 8 was automatically assigned. The Chennai-Kochi flight was just about two third full- may be due to Kerala floods or due to odd mid-day timing of the flight. Return flight was almost full. My ticket was booked in February during a sale. Boarding pass mentions fare type as "economy". It is not "Economy Lite" that Vistara introduced a month ago. However while food was being served, crew asked me if I wanted to buy anything. Apparently her manifest didn't indicate that I should given free snacks. I said I am entitled for free meals. One of her colleague recognized that mine is not Economy lite and granted my snacks. However she said she needs to take my boarding pass, to take a photo and report to company that they have given me free snacks. They returned the boarding pass after some time. Even while leaving the plane a staff remembered us and asked if we got our boarding pass back. Did not face this issue on my return- my guess is someone rectified the mistake from back end- so good work overall. Vistara has the most complicated food service in-flight. Cabin crew need to be very careful to comply with all combinations. 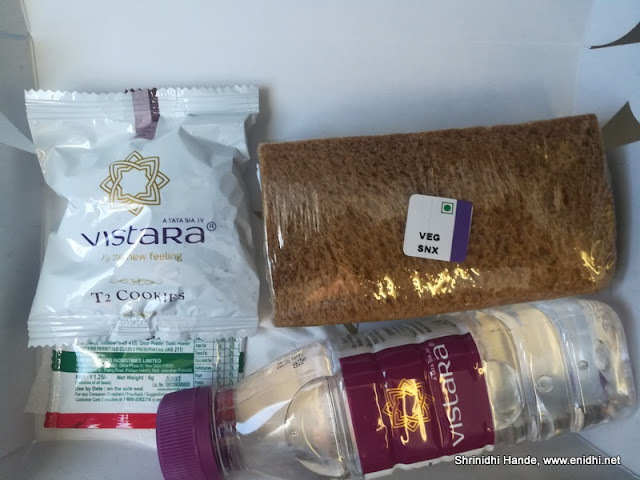 Vistara Economy Lite passengers are not entitled for free food. They need to buy. Whereas other ticket holders like Economy Standard, Economy Flex etc get to have free food. So cabin crew need to be very careful who gets free and who has to pay. This gets even more complex when some people change seats. 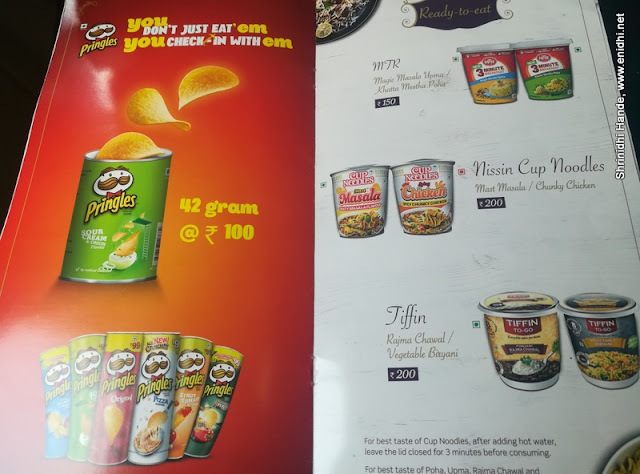 Besides free food for eligible passengers, Vistara also has an in-flight menu with items for sale. So cabin crew also have a mandate to try sell some food while they serve standard meals and snacks. Plus Vistara aircraft has 3 different cabin types- Business, Premium Economy and Economy. Business and Premium economy passengers get different food. In a short flight all this means too much work for cabin crew while executing in-flight service. But there were about 6+ cabin crew for a passenger count of 100-130+ and they did a good job within about 1 hour of flight. The food as such was a light snacks-nothing extensive for the 1 hour flight- May be Chennai-Delhi/Chennai-Kolkata passengers get better food. I would personally prefer to buy an Economy Lite fare that saves a few hundred and use that money to buy an Upma or Biriyani in-flight. If economy lite fare is cheaper than 300 rupees compared to economy standard, buy lite fare, spend Rs 150/200 to buy food, still save Rs 150-100. Note that no cash /wallet payment is accepted, only credit/debit cards. Vistara has an in-flight entertainment system similar to JetScreen. One day before my flight I got an email asking me to download Vistara world app. I did. But however on board I couldn't connect to anything. Tried multiple times throughout the journey- no luck. Informed cabin crew- who checked and said everything is fine- they showed me the app working in their phone. Without able to diagnose any further I said it is fine. But on my return flight I figured out the mistake- just turning WIFI ON and opening vistara world app wouldn't do. We need to go to WIFI settings, connect to in-flight WIFI first and then open Vistara world app. This was my mistake not reading instructions carefully. So on return flight I could access what's there on Vistara world- a bunch of movies, TV shows etc- nothing much exciting as most of them I had seen already on Amazon Prime. Only interesting factor I spotted was old in-flight Magazine- we could read any earlier editions from Jan 2018 as soft copy on Vistara world, which is a good initiative. In almost all other flights, airline staff take back major portion of boarding pass, leaving a small portion with passengers. In Vistara no one asked to collect my boarding pass- it was all mine. But may be it was a mistake- on return flight, they did take bigger portion of boarding pass. In-flight Magazine was decent, but I would rate JetWings and SpiceRoute a bit more better in terms of content. The onward flight was few minutes ahead of time while return flight was 15 mins late. Few days after the flight I login to Club Vistara account, but there's no trace of my Kochi flight and zero loyalty points added. Have sent a mail and DM on twitter to Vistara- so need to see how quickly they resolve it. Anyway I don't think I will fly so frequently and on higher loyalty point fares on Vistara to accumulate enough useful points before they expire, but no harm trying. Have booked two more tickets under their latest Flash Sale. Jet Airways services coffee/tea. Vistara didn't- may be flight was too small duration to have time for coffee/tea- not sure. Jet has also copied Vistara's Lite scheme and now offering fares without meals. Naturally Jet Airways network is much bigger, they have a larger coverage, more frequent flights while Vistara's coverage has lots of catching up to do, mostly for South Indian cities like Chennai, Bengaluru, Kochi etc. Overall the Vistara experience was pleasant. None of my FB friends had any complaints on this airline earlier. This could be partially because their fleet and coverage is much smaller and thus so is the probability of something going wrong. Their market share is slowly but steadily increasing, which is good. I heard Vistara will also plan some international flights from late 2018- best wishes to them.